Female octopus births about 200,000 eggs (depending on species) at a single time. She carries and protects these eggs while continuing to feed. Once the eggs hatch, the mother is left weakened from the constant care she has given her hatchlings, sacrificing her own needs for theirs. Soon after, the mother dies and the babies are on their own (the male dies not long after mating). 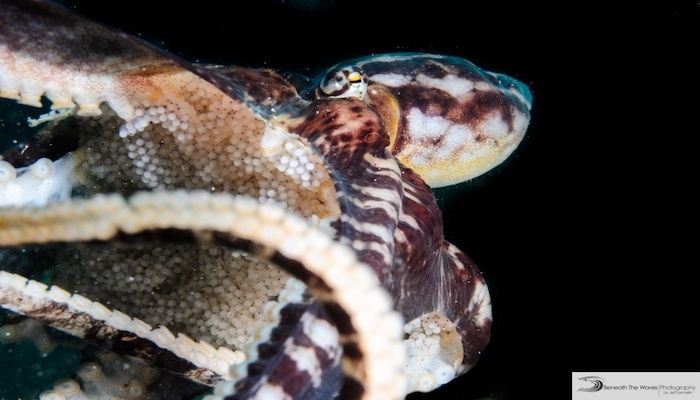 Jeff Lemelin from Beneath The Waves Photography shared his shots of a Mimic Octopus with eggs from his recent dive holiday with us. Have you ever seen a Mimic with eggs?